AMA Instructors Matthew Mulnix and Linda Tilton will offer a beginning ukulele workshop for kids ages 5 and up! They will focus on basic chords and techniques in order to play simple songs. Registration is $20 at the door, but space is limited so RSVP is required by emailing americanamusicacademy@gmail.com . What To Bring: Your instrument! Don’t have an instrument? No problem. We’ll have a few loaner ukuleles available. AMA 2018 Artist-in-Residence Tony Furtado! Americana Music Academy presents virtuoso Americana musician Tony Furtado for a full day of workshops during FidPick weekend! 7:30-9pm: Special Concert at Vintage Church, 1501 New Hampshire. Buy tickets for the concert here! Buy tickets for the Banjo Workshop here! Buy tickets for the Slide Guitar Workshop here! Concert and each workshop are $15/advance, $20/door. There will be a charge of $5 per person at the door to help offset recital costs. See you there! SECOND DATE JUST ANNOUNCED! Instructor Matthew Mulnix celebrates the release of his second album on Saturday, November 18th at 7pm, and Sunday, November 19th at 3pm at the Americana Music Academy in Lawrence, KS. Opening the show is Megan Luttrell, with performances from a few of Matthew's students. Seating is limited! Admission is $5 advance and $10 at the door, pending space. Reserve your seat today by emailing americanamusicacademy@gmail.com . Five Bar Gives Back to the AMA! Join us for a fundraiser and concert at Five Bar & Tables on Wednesday, November 8 at 7pm. 10% of proceeds benefit the Americana Music Academy. The concert will feature AMA instructors and community members, including Greg Pelligreen, Michael Paull, Matthew Mulnix, Rachel Black, and more! 10:00 am: Kids’ Drum Circle with Dylan Bassett! This workshop is designed for 2nd graders and up, but adults are welcome too. $5. 7:30 pm: Grace & Pierce Pettis House Concert, $15/advance, $20/door. SEATING IS LIMITED. Call 785-830-9640 or email americanamusicacademy@gmail.com to register. August 26, 12:30pm - 1:30pm, Workshop: Vocal Harmony with Ellie Grace. Experience the joy of group singing and gain some insight into the mystery of harmony! August 26, 1:45pm - 2:45, Workshop: Clogging with Ellie Grace. Now is your chance to get "feet-on" experience in Appalachian clogging. 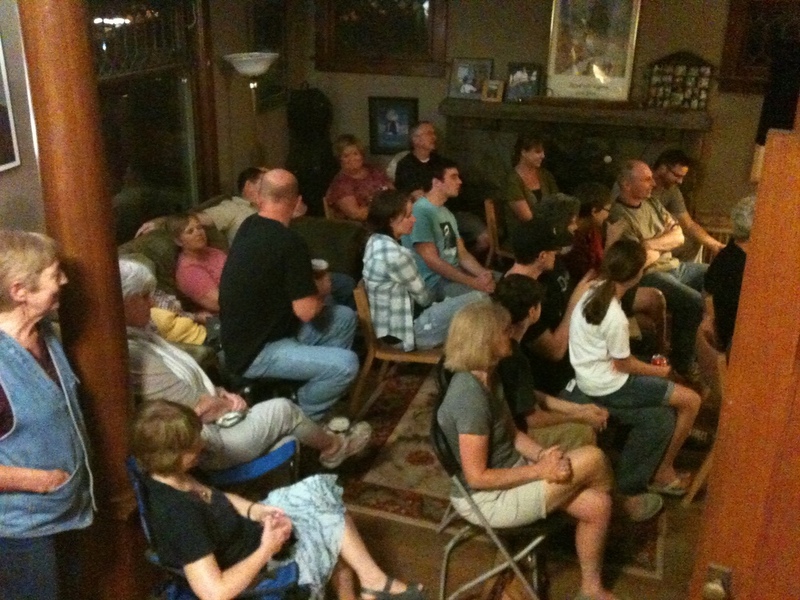 August 26, 5:30pm - 7:30pm, House Concert: Ellie Grace w/Special Guest Diane Gillenwater. All FidPick events on August 26 will be held at the Americana Music Academy. Admission for each workshop and/or the concert is $10/advance, $15/door. Space is limited! To register, call 785-830-9640 or email americanamusicacademy@gmail.com . Calling all Irish and Celtic music lovers! The Americana Music Academy is pleased to present Irish Music Guitarist Davey Mathias in a house concert Saturday, July 29 at 7pm. Davey comes to us from the deep south and brings with him a soulful approach and deep understanding of Celtic music, including the DADGAD guitar tuning that has become ubiquitous with Irish and Celtic music. He will be joined by local Celtic Flutist Turlach Boylan. Seating is limited! Email americanamusicacademy@gmail.com to reserve a seat. The Americana Music Academy will offer a Dulcimer Building Workshop for kids taught by dulcimer expert Allen Macfarlane. Mr. Macfarlane has toured the region teaching kids how to build and play their very own cardboard dulcimers at arts centers, historic sites, and schools. Students will learn how to build and play their own dulcimers through a unique workshop held over two full days. Construction of these cardboard dulcimers provides students with opportunities to express themselves artistically as they design their cardboard sound boxes, and to develop maker skills as they use tools to move their building project through to completion. Once assembled, children will learn playing techniques and will be able to take the instruments home with them. The musical instruction students will learn on this instrument will be forever special, as they will learn to play an instrument they've created with their own hands! The workshop is designed for Grades 4+, but adults are welcome too. Come learn the basics about copyright law that every musician needs to know! Featuring Attorney, fellow musician, AMA Board Member, and CLE Instructor Jim Jesse. You will learn why it's important for bands and joint authors to have an agreement, what it takes to claim authorship of a song or sound recording, what a copyright is and how to establish one, why it's important to register your copyrights, the two copyrights in every song, the six exclusive rights you get with a copyright, all the revenue streams songs generate and how to best collect revenue you're entitled to, and more! Registration is $10 per person. Seating is limited. Email americanamusicacademy@gmail.com to reserve a seat. All proceeds benefit the Americana Music Academy Scholarship Program. Jim Jesse has been an attorney for 24 years, and has been a full-time CLE presenter since 2013. He is the former General Counsel for Cool Music Network (THECOOLTV), which is a 24-hour-a-day music video television network. Previously, he was in private practice. He has founded Rock N Roll Law, and his passion is spreading music law through his seminars. Thousands of attorneys have taken his courses, and he has conducted his music law course now in many states (see below). He is also a member of the Association for Continuing Legal Education (ACLEA). He is also a singer/songwriter who has released two albums: Down on the South Side and Better Late Than Never. Mr. Jesse is a member of BMI and has run his own record label distributing his music. He has written songs for more than 30 years, and has more than 200 songs he has never released. He has studied music history for years. He is also the author of The Music Copyright Law Manual and the forthcoming The Musician’s Guide to Music Copyright Law. Mr. Jesse consults and practices in areas regarding intellectual property, licensing and music law. He has drafted and reviewed hundreds of contracts from small barter deals to multi-million dollar ones. To learn more about Jim Jesse, visit rocknrolllaw.com . Join us for the concert and bring your acoustic instrument for a jam! Hamburgers and hotdogs will be available with proceeds benefiting the Americana Music Academy. Seating is limited, please bring a lawn chair. Parking will be available at Central United Methodist Church. As a part of the 36th Annual Kansas State Fiddling & Picking Championships Kick-Off Event, join Michael Paull and Terri Laddusaw at Americana Music Academy Saturday, August 27 at 2:00pm for a workshop in harmony singing. This popular duo will take a familiar tune and teach three different arrangements of harmony singing. Beginning with the standard “academic-style” harmonies and moving on to the jazzy popular style of groups like the Andrews Sisters, the class will wrap-up with the rootsy, country style familiar from films like Oh Brother Where Art Thou. Come prepared to sing and join the jam session at 3:00. Registration is $10. Space is limited. Pre-register to reserve a seat by emailing americanamusicacademy@gmail.com . Come take part in a group drum jam. We have the drums and the sticks, just bring yourself! The drum circle is for kids in 2nd - 8th grade, but older siblings and parents are welcome too! This workshop is free but spots are limited. Reserve a spot by emailing americanamusicacademy@gmail.com or calling 785-830-9640. The Americana Music Academy Presents our Spring Fling Recital! Join us for an open house and full day of music at the Americana! We will begin with a Piano, Ukulele & Violin Recital at 3pm, then a Voice Recital at 4:15pm, followed by a Pickin' & Strummin' Recital at 6pm. There will be a small charge of $5 for admission to help offset costs of producing the event. The recitals will be followed by a reception and jam outside. We'll be grilling burgers and hot dogs! Bring a side dish if you wish, a lawn chair, and your instrument and come celebrate Spring with us! The Americana Music Academy Presents acclaimed Singer/Songwriter and Artist-in-Residence Matt Nakoa. To learn more about Matt Nakoa, visit www.mattnakoa.com. Tickets are $10. Seating is limited. Please email americanamusicacademy@gmail.com to reserve a seat. Executive Director, Rachel Black, will open the show with a special singer/songwriter set. The Americana Music Academy is throwing their annual open jam and concert in South Park on Saturday August 22, 2015 to help kick off the Kansas State Fiddling and Picking Championships to be held the following day, Sunday August 23, 2015. We invite you to bring your instrument, a chair or blanket, and jam along with your friends, while you enjoy a cold beer. Stick around for some great live music and food, and help Americana Music Academy by just having fun and enjoying yourselves. Food vendors will provide food for purchase as well as Free State Brewing Co. will have beer available for those over 21. This will be a benefit for The Americana Music Academy. Americana Music Academy will be offering our Spring Recital for students, teachers, and associated bands at the lovely Castle Tea Room in Lawrence Kansas. This is an opportunity for a smaller, more formal event than our Winter Recital. This program will be limited to about an hour in length and will feature many of our students looking to perform as musicians. Join Americana talents for live music at Morningstar's Pizza, on Monday evenings during the month of May. All profits from those days will benefit Americana Music Academy. Starting at 6pm., come down for some great Italian dishes, NY style pizza, and listen to some of the best musicians in town. We'll be posting the schedule soon. Please come and support great mucis, non-profits, and Morningstar's Pizza! Click, here, for more information. KSF&P partner, Americana Music Academy, will host a Fundraiser Party/Concert/Jam with multiple jamming areas (including inside air-conditioned). We will be selling hot dogs, hamburgers, chips, beer and soda. Bands and solo acts will play outside from 6:00 until 8:30, when open community jamming begins. Last year we jammed pretty late, so don't goof and leave your instrument at home! We will have some tables and chairs, but you may want to bring your own chair. To sign up for a band or solo SLOT call 785-830-9640. Come to join the jamming or to just listen and enjoy. Join us for a new twist on country music with Tenasie, featuring Josephine Michener on Fiddle! Our old friend Josephine is returning to Lawrence with her current band, so please support live music by coming to hear watch she's up to along with her band Tenasie.